How many of you have seen this tree at one of our auctions or raffles? Well, not this one exactly, but many a tree just like this have made their way off our benches and into the donation pile. Such was the destiny of this Engelmann Spruce. Many years ago when my grandfather passed away, I inherited most of his bonsai. 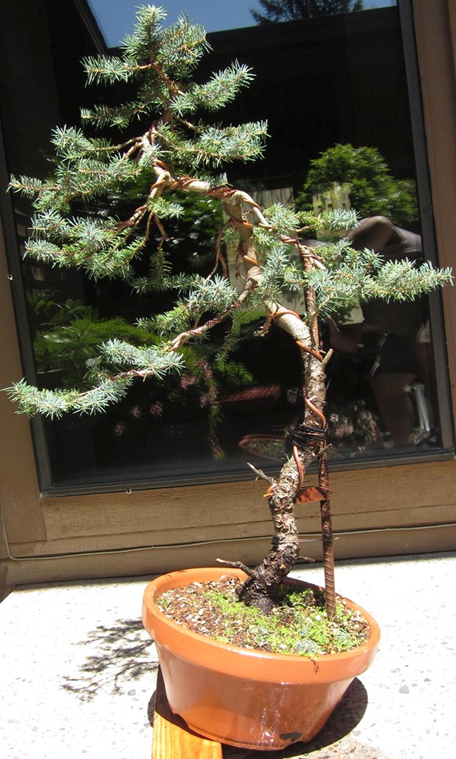 He’s the one that actually got me interested in bonsai, and he must have dug this up as a seedling on one of our collecting trips. It’s had an interesting life so far. After watching some Floridian bonsai teacher on television, my grandfather was convinced that planting trees in pure sphagnum moss as a soil substrate was the way to go, and this tree was one of those experiments/victims. Actually, the tree did not suffer too much as it was in a very shallow plastic saucer so that it couldn’t hold much water anyway. It literally sat in the back corner of my bonsai bench for many years. The tree started out only 10-12 inches high – where the first branch is in the picture. It started to grow, then shot up. But the container and myself did not keep up with the rapid growth and the tree’s health ultimately took a nose dive. the tree into a larger container and get it back to health. The tree responded quickly to good soil and better conditions (light, water, fertilizer). After only a year the tree was ready to be styled. I love bunjin trees and this one in particular was a good candidate. It had no lower branching and was tall and narrow. But what this tree had over any garden variety seedling was age. It was obviously very old already, with flaking bark at the base. Engelmann also has nice short needles, so the scale would work great. Our challenge was to come up with a design that could take advantage of the great bark at the base and make this stripling into something. You can see Lisa in the photo bending the trunk with #6 copper. Actually, she might have had a little help with “her” tree. We ended up using rebar, blocks, and guy wires to hold the trunk in place. We applied so much force that we were already cutting into the bark before we finished styling. We should have used some raffia here. Experience is a great teacher. 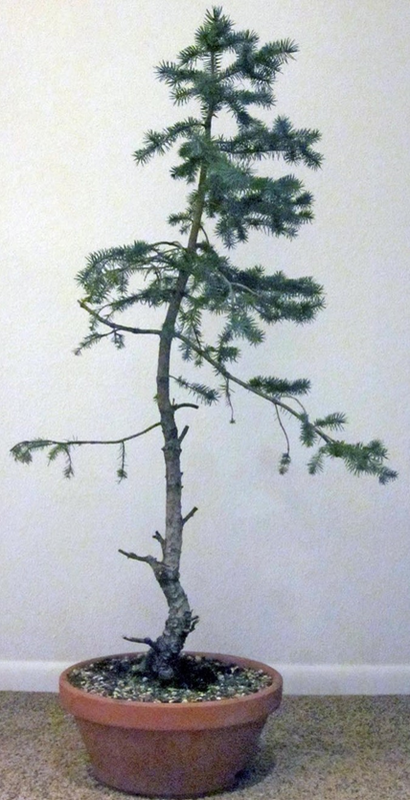 Spruce is very flexible, but can easily spring back. I wanted to both exaggerate the angles, and get plenty of movement going. The tree already had good caliper, so there was a lot of grunting involved. This is also about the time the tree got it’s nickname. I explained to Lisa that this was a bunjin or literati style tree. Being an unfamiliar word, she just sort of unconsciously inserted the closest sounding word she knew – Liberace. You know, the flamboyant pianist from the sixties and seventies that wore sequins and ruffles on everything? That guy. So the name stuck. You can see the results just a few months later. The original photo was taken in early February of2015, and the styling happened just a few weeks after. The styled photo was taken in June of 2015 after the first flush of growth, and at its new home. The tree responded incredibly well and we had nice, lovely wire scars by fall. We dewired the tree and it was later rewired in the spring of 2016. We also moved it into a new Jim Gremel nanban style pot. You can see by the container sizes that this was an aggressive move. It definitely slowed the tree down a bit, but it recovered nicely. 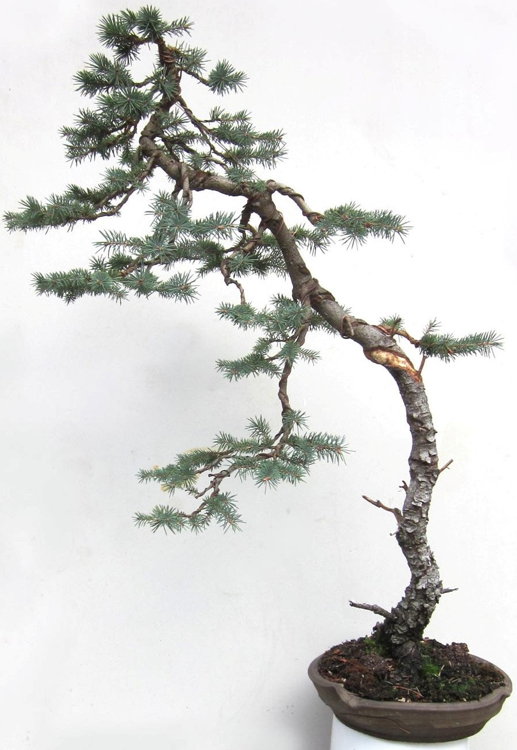 However, it was later hit by a bout of Rhizosphaera Needle Cast on a few of the branches, which I initially thought was just a symptom of the repotting. 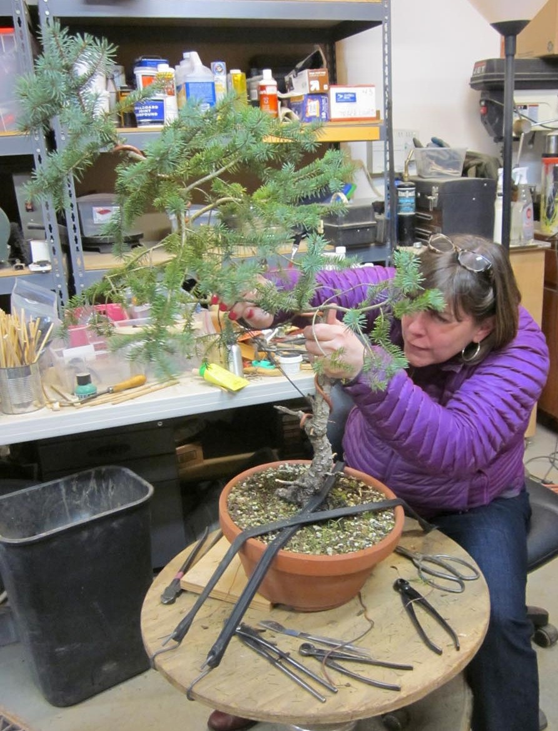 When Todd Schlafer presented at our club, he mentioned the disease, which strikes spruces. After a bit of internet research I confirmed the disease, treated it, and the tree did just fine this year. Fast forward to this fall, 2017. I lightly wired some extending branches and tuned things up a bit. I also started opening up the trunk, removing a bit of bark to help disguise the wire scars. I hope to make this one very old and gnarly looking tree. Three growing seasons and look what can be accomplished. One or two more years and it may be ready to show. 2017 The tree is well on its way.